What are multi session events? Customers of WorkCast Producer+ and Enterprise licenses have the option to create and run multi-sessional events. Take a look at two working examples listed below demonstrating the registration, email and page viewing experience. This working example shows the full end to end user experience from registration process and confirmation email to the fully live event pages. 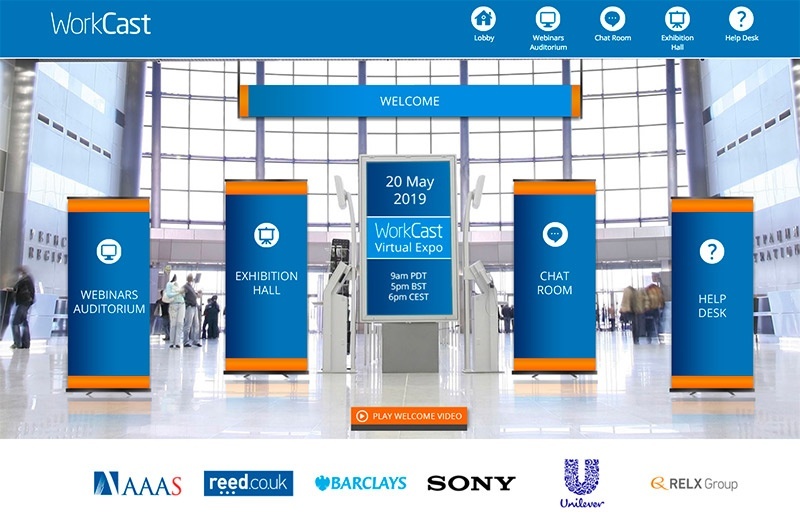 You can browse individually branded exhibitor booths, the live chat room or individual webinar pages. 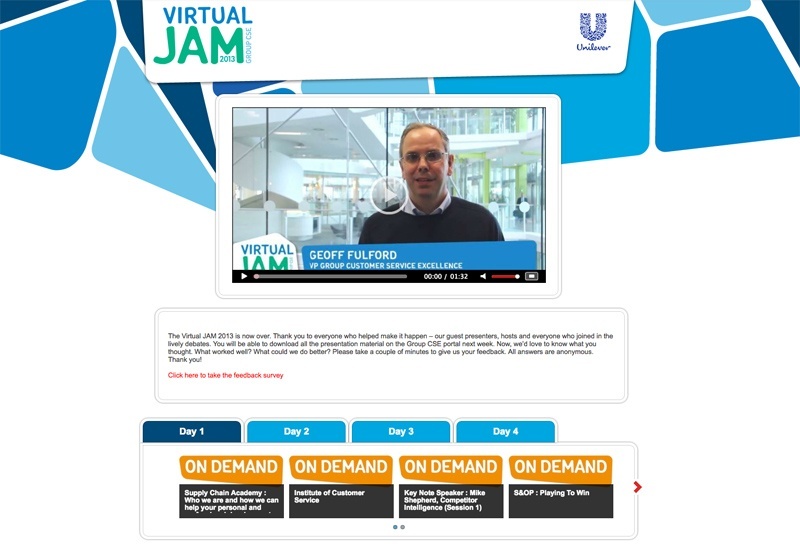 The second example shows a more traditional layout with no exhibition lobby and the focus more on webinar presentations. The lobby includes a live Twitter feed and shows how you can separate webinar presentations in to filter sections. 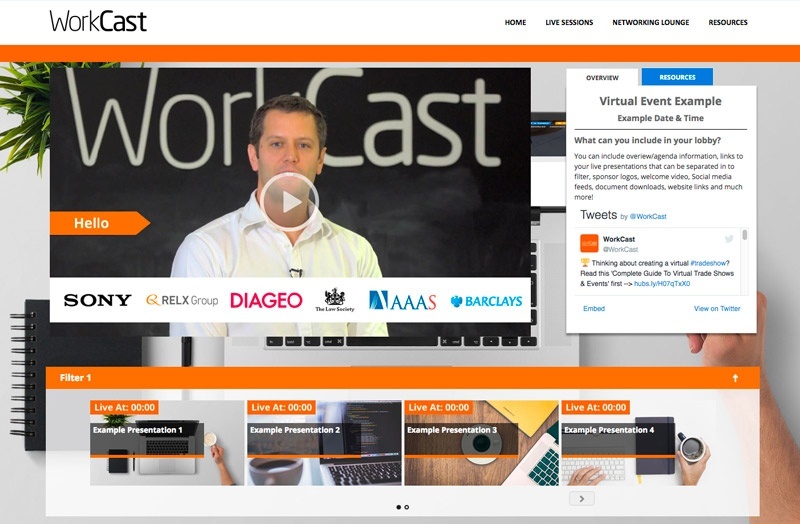 WorkCast customers are able to create a wide range of online event experiences using the Event, Channel and Event Session capabilities of the WorkCast Platform,. Please contact your account manager or support@workcast.com to find out how you can have multi-session virtual event templates as part of your account. Register for the overall event or the speakers you are interested in. A lobby page provides the agenda and channel providing access to the individual featured presentations. Overall event registration with different tracks for employers, job functions, departments, etc, with the ability to watch presentations, ask questions and apply for roles. Overall event registration with students able to view a range of presentations (Event Sessions) from different faculties (Channels), departments (Channels) and apply for courses. Secure registration for the event with channels displaying different departments. Staff watch and interact with the individual presentations. To discuss your event scenario, speak with a member of the WorkCast sales team or with your Account Manager.